The air that residents of New Delhi breathe takes three years away from their life spans, says a recent study by Michael Greenstone of the University of Chicago. The study quotes data from the Central Pollution Control Board (CPCB), which reveals that 77% of Indian cities and towns exceeded National Ambient Air Quality Standard (NAAQS) for respirable suspended particulate matter (PM10) in 2010. Estimates from the World Health Organisation (WHO) suggest that 13 of the 20 cities in the world with the worst fine particulate (PM2.5) air pollution are in India, including New Delhi, the worst-ranked city. India has the world’s highest rate of death caused by chronic respiratory diseases. Any corrective measure comes up against public apathy, especially the ambition of every resident to buy ever-larger cars that use diesel. Any move to equate the costs of diesel and petrol faces opposition from farmers who use diesel irrigation pumps – a fact used to great effect by car manufacturing lobbies. As for the government, it continues to advocate the use of coal as the mainstay of power generation in India. The country has increased its coal generation capacity by 73% in the last five years, and current plans are to add another 110 GW of coal power by 2022. Supporters of this policy say it is the only way out, as electricity generated by burning coal is cheaper than by using sunlight or wind. But this does not take into account the cost that individual Indians bear to treat respiratory diseases caused by coal burning. Nor does it take into account the lost productivity as millions of people are unable to go to work due to such diseases. Nor does it take into account the destruction caused by coal mining. Coal burning is the biggest contributor to India’s greenhouse gas (GHG) emissions. The country is already the world’s third largest emitter of GHGs, which are causing climate change. In this year when an international deal to combat climate change is being negotiated, India is under pressure from the global community to rein in its emissions. But the government is refusing to take any step on the coal burning issue, on the plea that around 300 million Indians who are outside the power grid must get electricity. While that need is irrefutable, using coal power for the purpose is estimated to take global GHG emissions on a steep upward curve, while affecting the health of millions of Indians. The study says that broad areas of the country, particularly in north India, are well out of compliance with the standard. This non-compliance holds in rural as well as urban areas. Fine particles can travel long distances from where they are originally emitted, imposing health costs on even those people who live far from major sources of pollution. Rural India also directly faces particulate air pollution from local sources, such as biomass combustion. The study states that 660 million people (54.5% of the population) live in regions that do not meet the 40 μg/m3 (micrograms per cubic metre) NAAQS and 262 million people (21.7% of the population) live in regions with air pollution levels at more than twice this standard. Nearly every Indian (1,204 million people, or 99.5% of the population) lives in an area with PM2.5 pollution above WHO’s 10 μg/m3 guideline. The study compares Indian cities with US, European and Chinese cities and find that Indian cities, with an average PM2.5 concentration of 46.0 μg/m3, are far more polluted than those in Europe (21.7 μg/m3) or the US (9.6 μg/m3), and polluted even in comparison to China, where cities average 40.4 μg/m3. 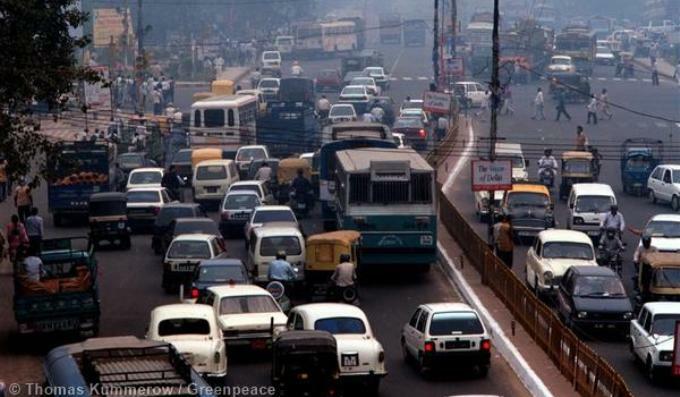 A number of Indian cities have very high fine particulate levels – above 75 μg/m3. “There is substantial variation in the levels of stringency adopted by countries while setting national air quality standards. At the current prescription of 40 μg/m3 for annual PM2.5, the Indian NAAQS is four times the WHO guideline and is the least stringent of the four regions,” states the study. Worse, at no point in the last quarter century have average urban SPM concentrations in India met the 140 μg/m3 suspended particulate matter (SPM) standard. Despite a very slight downward trend in average pollution over the last 20-plus years, the last five years show no trend towards either way. “The loss of more than two billion life years is a substantial price to pay for air pollution. And yet this may still be an underestimate of the costs of air pollution, because we do not account for the impact of other air pollutants, the impacts of particulates on morbidity or labour productivity, as well as preventive health or avoidance costs borne by Indian households,” the study states. Greenstone says that past studies have shown that environmental improvements in developing countries can lead to longer and healthier lives, which are critical ingredients for economic growth. In a study released in 2013, Greenstone found that people who live in northern China are set to lose a total of 2.5 billion years of life expectancy compared to those living in the south, due to the extensive use of coal in power boilers for heating north of the Huai River. On February 18, the US launched a joint air quality programme at select diplomatic missions, including New Delhi. Since real-time air quality data are unavailable in many areas, the State Department and EPA’s collaboration will provide data from these missions to EPA’s AirNow platform. “It also will enhance the availability of ambient air quality data and expertise around the world, offering a greater opportunity for the United States to create partnerships on air quality with other nations,” says the Department of State. During US President Obama’s visit to India in January, one of the agreements reached was to implement EPA’s AIR Now-International programme and megacities partnerships, focused on disseminating information to help urban dwellers to reduce their exposure to harmful levels of air pollution, and enable urban policy planners to implement corrective strategies for improving ambient air quality keeping in view health and climate change co-benefits of these strategies. However, any progress in the initiative is yet to be seen. Recently the New Delhi-based think tank Centre for Science and Environment (CSE) presented an agenda for action to fight air pollution in India’s capital. The agenda was aimed at the Aam Aadmi Party, which was elected to power in Delhi a few weeks ago. In February 2015, CSE monitored air pollution levels in buses, autos, the metro, and while walking – mainly to assess the level of pollution that average citizens are exposed to on a daily basis while travelling in the city. The CSE analysis showed that SPM exposure in all transport modes is very high. The average levels recorded are 2-4 times higher than the background levels reported by Delhi Pollution Control Committee. Open modes like auto rickshaws, walking and cycling have the highest exposure. During off-peak hours, all modes show lower levels: Difference between peak and off-peak was – auto rickshaws 1.3 times higher; walking 1.5 times higher; and buses 2.5 times higher. Travelling underground in sealed metro trains showed lower SPM levels of 209 μg/m3, but when the same trains travelled above the ground, passengers were forced to inhale 330 μg/m3. The CSE study showed pollution levels increase when traffic is stationary at junctions and in traffic jams. In a traffic jam on a stretch close to Paharganj, levels peaked at 1,170 μg/m3. At a traffic jam near Govindpuri Metro Station, the peak level was 725 μg/m3. Proximity to diesel trucks lead to extremely high exposure. A cycle rickshaw ride on NH 24 in close proximity to truck traffic recorded a range of 651 to 2,000 μg/m3. The SPM level was measured inside a car during off-peak hours – the average was double the ambient level. CSE asked Delhi’s new Chief Minister Arvind Kejriwal to implement the Air Quality Index with health advisories and pollution emergency measures, leapfrog emissions standards to Euro V in 2017 and Euro VI in 2020, control dieselisation with tax measures, and improve public transport, especially last mile connectivity.